Related California’s winning bid to build a 56-story tower designed by architect Rem Koolhaas and the Office for Metropolitan Architecture (OMA) at the corner of Folsom and First, along with a Fougeron Architecture designed mid-rise along Folsom and Fremont, included a total of 653 residences, of which 177 were to be Below Market Rate (BMR). But based on the market demand for larger units and a redesigned tower core, Related has cut 99 units from their Transbay Block 8 development plans, a cut which includes the loss of 27 BMR units. The redesigned plan for the Transbay Block 8 Tower now includes 124 market-rate condominiums (down from 162) across the top 23 stories of the tower, with 280 market-rate rentals (down from 314) on floors 8-31. 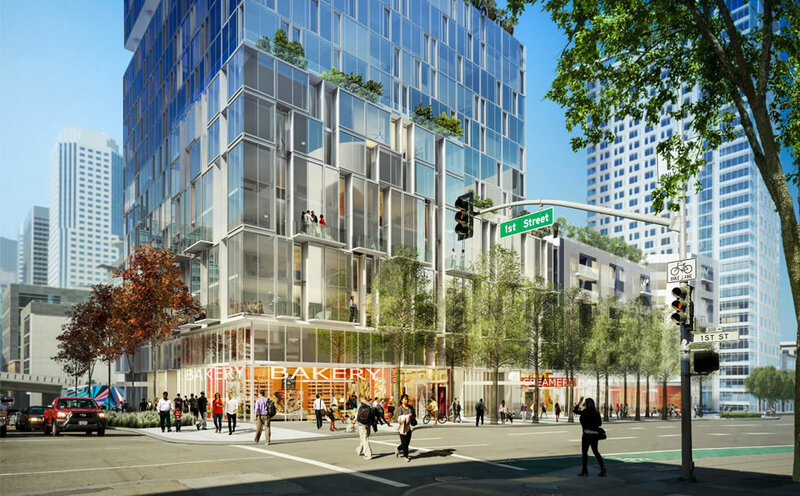 The project’s 150 below market rate rental units, which are earmarked for San Francisco residents earning up to 50 percent of the area median income, will be located in the tower’s podium (floors 1-8) and the adjacent mid-rise building. Related has also reduced their previously proposed grocery store space by 45 percent, which means Whole Foods is out and the developer is now seeking a “comparable” type of grocery to fill the space. So what’s in that 120000 square feet of underground space, then? That’s more than enough room for 204 parking spaces. SOMA is becoming more and more a sea of towers that people drive to, park underground and take the elevator to their units. It will never be as vibrant as established neighborhoods in the city, like the Marina, Castro, Hayes and Valley, simply because of its design. No one is trying to claim that it will be, or that it’s being designed that way. Some people like the sterility. Others don’t. depends on the vibe you like and how you rate them. SoMa already has about twice the resident population of any of those neighborhoods, and the daytime population is more than ten times as much. A booming business district, museums, convention center, baseball park, …. It is becoming more like north of market: the fidi/nob hill/tenderloin. SoMa is among the prime places in the entire Bay Area where people go to create and recreate. Sheesh, there are more people at the Giants game right now than in the entire Marina or Castro. By the common meaning it is among the most lively/vibrant places in SF and has been for a long time. I personally like all these neighborhoods and the variety they offer, but those are all lower density, more relaxed, slower tempo, less urban places than SoMa. If you ask me, it will only help add to the growing vibrancy of Lower Market and Central SOMA (arts district) etc. And if anything… the parking lots will be full of dusty, underused cars—by proxy. @Mark. Exactly. That’s the same reason Manhattan, Hong Kong, Tokyo, and other cities with loads of tall residential towers are so boring, quiet, and dare I say the antithesis of vibrant. SoMa is becoming more and more a sea of towers in whose garages people leave their car parked while they walk to work downtown. I know, my 2 block commute means the wheels rarely get used. SoMa’s automotive problems are due to Bridge folk queuing up to head east, not those of us who live in the district (and choose to drive only on weekends when the traffic is sparse). That building doesn’t make a lot of sense. Market rate condos + rentals + BMR? Is there going to be one HOA? A poor door? Why would I want to buy a condo and pay high HOAs when most of the units will be rentals? So to avoid the shame of the poor door, the building should be all market rate and the second class citzens can live somewhere else with their own kind? Actually, how are HOA dues established, if a large part of the building is rental? Usually, all tenants pay an HOA based on the needs of the building divided proportionately among the building’s tenants. How are costs divided? Even basic expenses, like window washing? Is there an established formula? This is such a beautiful project. 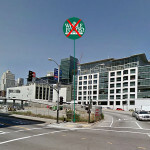 I too have qualms about the Audimobile centric nature of the Transbay and Rincon neighborhoods. This is BS. I’m sure they’d have no problem selling the smaller units. Families hate cubbies. In another 20 years, downtown will be family friendly with larger and larger spaces (just look at what’s taking place in mature cities). Don’t mind micro cubby things, but our city is strengthened by having long-term stable families -as well as the fleeting social and tech climbers who up and leave on a dime. And nothing wrong with “uber-wealthy) families. All cities have them. The MR condos at the top of the project will not house many families. 1800 sf each average , either 2br or 3 br — they are being targeted at wealthy one or 2 person households, or investors, who can pay for this amount of space. it is the top of luxury market. They are proforma-ing $1600 PSF, hoping for $2000. just do the math. Increased demand of sfusd from these projects will be nil. and not much for town schoool either , ps. Related is the master of getting as much capital out of BMR units as possible, and of separately them from MR units enough so will be non-issue for buyers. Bingo. They are catering to the rich set. Many of those units will be empty a good portion of the year. Plus they diversified the bldg nicely, with some rentals as well. Last up market 05-07 almost all newly built residential towers were for sale condos only. But with interest rates low and rents sky high it makes more sense for insurance co’s and other long term funds to own rentals in SF. Why do you think these will be unappealing to rich families? San Francisco does not have a very high proportion of families and I am sure that will be reflected in these buildings also. But these are large units in which a family could live — why wouldn’t they? WTF? We’re in the middle of a housing crisis and the city is going to allow Related to build 15% fewer units than they bid because they can get more money for larger units? If they don’t want to build all the units they bid, let them forfeit the parcel without penalty. Or at the very least, the city should require Related to build all 177 BMR units. I believe Related’s bid for the parcel was purely based on dollars (and overall land use), not a specific number of units. So they aren’t changing the terms of their parcel acquisition by doing this. The city is, in fact, promoting the development or more larger “family-sized” units and should be delighted by this change, especially if the smaller number of BMR units means some of them will be 3 bedrooms also. Yes, this is the key thing here. What is the net change in the number of bedrooms? Typically a 3 bedroom unit is the size of two 1 bedroom units but has 50% more bedrooms. I’m very curious how the large number of BMR units are going to be integrated with the market rate rental and condos. Related will probably need top dollar for the condos for this to work. Isn’t this one of the last “tall” towers to be built in SF? 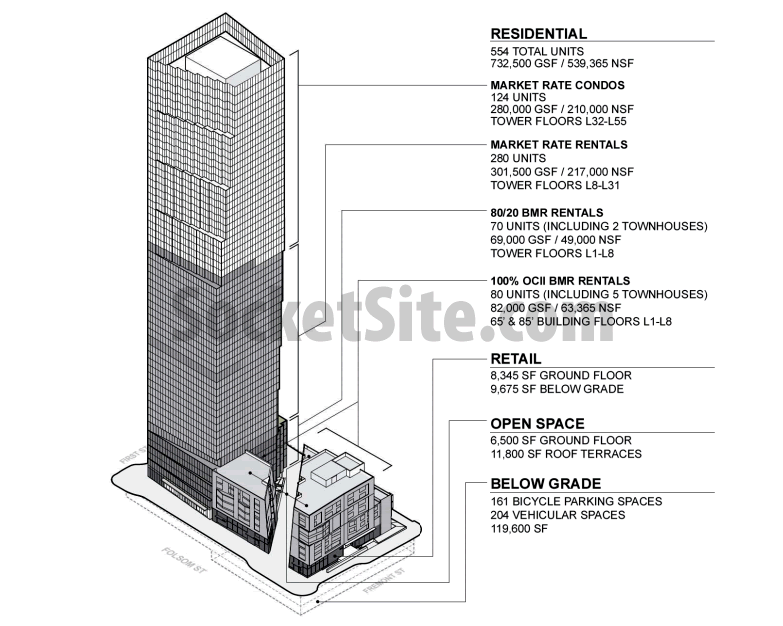 Most of the sites not yet developed for SOMA in Transbay area are for 30ish story buildings as I understand it. Yeah the mix of commercial, rentals and condos sounds strange. The building however will be a great addition to the area. This combined with the trend discussed in San Francisco Business Times story today that there is an uptick in the tech sublease office space market point to a flattening of demand. The % of BMR housing requirement should be based on total building square footage, not number of units, as developers can just game this requirement by doing larger but fewer market rate units, like this developer appears to be. So the original plan was not earthquake safe? 🙂 i’m sure DBI and Mel Murphy will get right on that. They say these One RIncon Tower type proposals are safe – but I would hate to be standing on the street next to one during a sizable earthquake. I think broken glass is going to be everywhere. How soon we forget the lessons of 1989 much less 1906. SF should focus on building more disaster resistant mid-rise housing – not seeing how tall we make Gavin Newsom’s pet project phallic symbol. Actually, there was not a single huge use building that failed during either the 1906 (all the tallest buildings of the time survived quite nicely, though a few suffered fire damage) or 1989 earthquakes. However, NUMEROUS one to four story buildings failed and killed people, including during the 1989 earthquake. So, the lesson to be learned world seem to be that taller buildings are far safer during an earthquake. Also, I am not sure what Gavin Newsom has to do with anything? He has not been the Mayor for quite some time. Wake up, Rip Van Winkle. Agreed that all the crappy little un-retrofitted buildings are the worst danger – But I am pretty sure the snow plow attachments kept at downtown SF Fire Station #13 are not for snow. After 1989 the City emergency dept asked that they be bought because their plans estimated in a 1906 type quake the glass downtown could be 3 to 4 feet thick in spots and the streets impassable. As we saw from the twin towers – really tall buildings are not great for emergencies. So true. The chances of surviving the impact of a commercial jetliner are significantly higher if you’re in a Victorian instead of a high rise. Pablo, as Scott pointed out your chances of surviving a direct impact from a high speed jetliner are so much lower in a small building compared to a tall tower that it makes your comment about the Twin Towers so ridiculous, one doesn’t even no where to begin with addressing it. No one died in a tall building during either of the two biggest earthquakes in San Francisco, period.